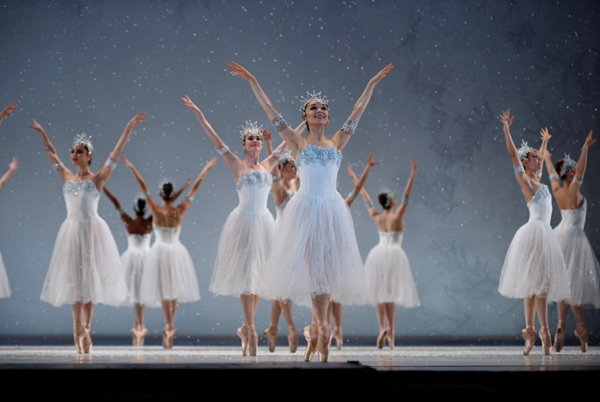 Snowflakes and sugar plums; magic and merriment – all await at San Francisco Ballet’s splendid Nutcracker, which just began its 2016 engagement on Saturday evening. Choreographed by Artistic Director and Principal Choreographer Helgi Tomasson, this Nutcracker has it all: a forward moving narrative arc, character depth and development, thoughtful choreography, innovative artistic choices and formidable dancing. And while the Nutcracker certainly provides a meeting of holiday lore and classical ballet, Clara Stahlbaum’s journey is also a reminder of the porous space between reality and fantasy. Act I takes its audience to the Stahlbaum family home on Christmas Eve, a space replete with all the excitement and wonder that this special evening holds. Amidst the lights, tree, gifts and fellowship, the aura of celebration and anticipation is palpable. Uncle Drosselmeyer (Rubén Martin Cintas at this performance) arrives with captivating mystery, and of course his masterful tricks and illusions. He awakens three life-size dolls to entertain the children – a jester character (Myles Thatcher) with his lithe developpés and splits; a princess doll (Lauren Parrott) with her single-footed relevés and boureés; and a Nutcracker Prince (Hansuke Yamamoto) with his parallel pas de chats and tours en l’air. The party concludes, the guests depart and everyone in the Stahlbaum residence turns in for the night. That is, until Clara (Anna Javier) comes downstairs looking for the Nutcracker doll that Drosselmeyer had given to her, and ends up falling asleep on the chaise lounge. In the moments and scenes that follow, a parallel dimension/dream world descends. Orchestrated by Drosselmeyer, furniture and surroundings transform and grow; a battle is fought between mice and toy soldiers; the Nutcracker Prince (danced by Carlos Quenedit, a cast change due to another dancer’s injury) comes to life. And during the battle scene, Alexander Reneff-Olson stole the show as the King of the Mice; his was one of the best interpretations I have ever seen, not just in this production of Nutcracker, but in many others as well. Bravo. Act I closes with the glorious snow scene, my favorite part of the entire ballet. As Queen and King of the Snow, Mathilde Froustey and Carlo Di Lanno were sublime. In the opening sequence, their unison work was spot on, and they had such suspension and release as they moved through the delicate lifts. The corps de ballet (which is always an ever-changing entity) looked great – a solid and cohesive team. And Froustey’s fouettés were a thing of technical and artistic magnificence. Act II continues Clara’s magical sojourn to a vibrant world of diverse characters, variations and divertissements, all under the command of the Sugar Plum Fairy (an inspired performance by Sofiane Sylve). The Spanish pas de cinq handily and musically delivered their brief but complicated offering; the French trio keenly maneuvered their choreography while simultaneously managing the sometimes uncooperative ribbon wands. WanTing Zhao, Daniel Deivison-Oliveira and Anthony Vincent (all soloists with the company) gave an intoxicating interpretation of the Arabian pas de trois - sinuous, stretchy and sensual. But the off-center stage spacing was a little curious at times. It was unclear whether this placement was purposeful or not, though it certainly did not detract from their impassioned performance. The audience favorite Russian trio (led by Wei Wang with Benjamin Freemantle and John-Paul Simoens) delighted with acrobatic leaps, rhythmical musings and textbook unison. And Francisco Mungamba’s Chinese variation was definitely an Act II highlight – sprightly and playful, with technical accuracy and precision. Once again, the corps impressed as the Waltzing Flowers, and as the featured soloist, Sylve shone with grace and aplomb. Tomasson’s choreography for this scene runs the gamut from turning sequences to footwork patterns, from petit allegro to grand allegro, and yet, it all clings to the foundational ‘down, up, up; down, up, up’ meter of the music’s three/four time signature. Simply gorgeous. As the ballet nears its conclusion, there is yet another moment where reality and imagination meet. Clara transforms into an adult and she dances the grand pas de deux with the Nutcracker Prince. Vanessa Zahorian and Quenedit were technically sound as they moved through this duet, their subsequent solos and then, the coda, though for me, opening night’s grand pas de deux was missing its narrative dazzle.